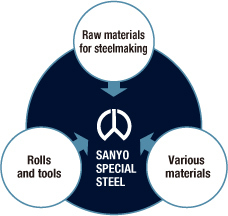 ﻿ Raw Material & Supply Department | Locations | Yohkoh Bussan Co., Ltd.
We leverage our procurement capabilities as a trading company to support the production of Sanyo Specialty Steel, a leading producer globally for its technologies. We supply a wide range of various products required by special steel manufacturers, spanning from raw materials for "Steel You Can Count On" to a truly wide range of rolls and tools, various materials, and office supplies. Please contact us from the applicable page if you would like to supply products to Sanyo Specialty Steel through Yohkoh Bussan. In addition to iron scrap, stainless steel scrap and ferroalloy, each of which are used to make steel, we also supply dedicated fireproof bricks for use in electric furnaces and flux materials. iron scrap, stainless steel scrap, ferroalloy, fir proofing materials and flux materials, etc. We procure rolls and tools essential for production lines of hot rolling, extrusion and cold rolling of steel pipes and bars. Tools for making pipes, rolls for blooming and rolling bars, etc. We supply a truly wide range of supplies required on the production floor, including grinding stones for deburring and cutting steel materials, wire ropes for hoisting products, and iron wire for joining steel materials. Paints, hoisting attachments, iron wires, couplings, cutting blades, grinding stones, cutting tools, general tools, lumbers, chemicals and lubricants, etc.